SUPERIOR, Wis. -- An explosion rocked a refinery in northwestern Wisconsin, injuring at least 11 people Thursday, forcing the evacuation of homes, schools and a hospital, and sending a plume of noxious smoke billowing into the air. Authorities said Thursday evening that the fire has been extinguished. 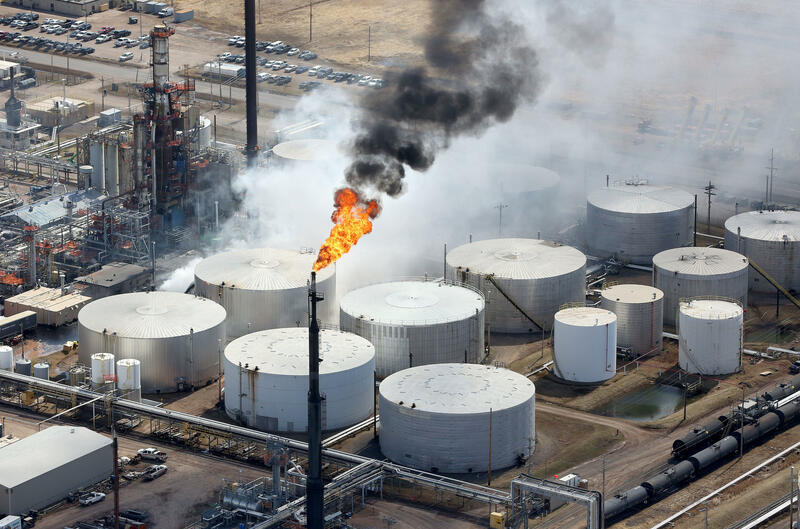 Authorities said a tank of crude oil or asphalt exploded at the Husky Energy oil refinery in Superior, a city of about 27,000 that borders Minnesota and the westernmost tip of Lake Superior. That prompted them to order the evacuation of a three-mile radius around the refinery, as well as a 10 mile corridor south of it where the smoke was heading. Police were spotted going door to door urging occupants of buildings to leave for their safety, in some cases asking businesses to shut down their operations. Some Superior and Douglas County residents said they could feel percussion from the explosion that started the fire from more than a mile away, with some experiencing a momentary power outage. There were no reported deaths, but at least 11 people were injured, including one who was seriously hurt. They were being treated at hospitals in Superior and nearby Duluth, Minnesota. Douglas County Emergency Management has issued an evacuation order. If you are within a one mile radius of the refinery, 10 miles to the South, please evacuate now. Essentia Health spokeswoman Maureen Talarico said one of the 10 patients at Essentia facilities had a serious blast injury; the other nine had injuries that were not life-threatening. St. Luke's Hospital in Duluth was also treating one person, who was in fair condition, spokeswoman Jessica Stauber said. Winds coming from the north have spread smoke from the fire across a large swath of land extending at least 10 miles south of the blaze, with some reports of smoke spotted in the village of Solon Springs nearly 30 miles to the south. Johnson was working from home at the time of the blast. She said the windows shook. "It felt like something had hit the house, like a vehicle or a branch from a tree. ... Our dogs started barking. It was a stressful moment," she said. She also wondered if a plane had crashed and feared her house might collapse. She looked around but didn't see anything - then a few moments later she saw dense black smoke rising over the trees. There was no immediate evacuation order, but by lunchtime, they had to go. Tudor went home as the clouds in the sky were masked by thick, black smoke and the air smelled like burning tires. "It was scary," Tudor said. "We threw our dogs in her car. I put the cats in my car, ... we grabbed our toothbrushes and just left. ... We were mostly focused on the pets because it smelled like burning tires outside and we knew that wasn't a good smell." Tudor, a scientist at a research company, said residents haven't been told much about the potential danger, what is in the smoke or why it is so black. But she said it's clear people shouldn't be breathing it in and she wonders how it will affect the water and air quality. Though it wasn't certain what was in the tank that burned, oil smoke can contain a mix of noxious hydrocarbons and other chemicals with potential short- and long-term health effects. Superior is not a stranger to industrial accidents prompting mass evacuations. In 1992, a train containing benzene gas derailed just south of the city, covering the region in a bluish, toxic haze. The event, which has come to be known as "Toxic Tuesday" among many locals, forced the evacuation of nearly 30,000 people from the city. CBS News' Alex Derosier contributed reporting.